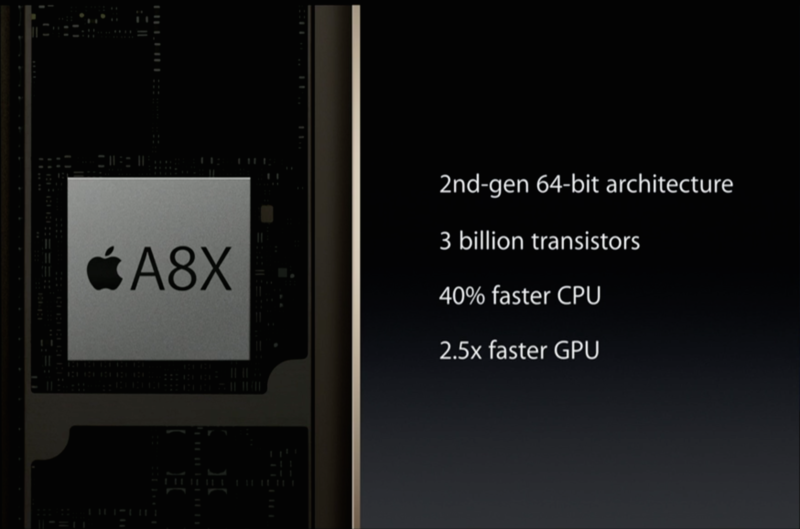 The Apple A8X is a high-end ARM SoC (System on a Chip) introduced in October 2014 alongside the iPad Air 2. The three CPU cores are clocked slightly higher than the two inside the Apple A8 (+100 MHz). Apple claims a 40% improvement over the 1.3 GHz Apple A7 compared to just 20% from the A8. Furthermore, the A8X integrates a much more powerful GPU (2x 4-core PowerVR Series 6XT (Rogue) GXA6850) as well as a 128-bit LPDDR3 memory controller. With Cyclone 2, Apple has managed to improve the already high performance-per-clock of the original Cyclone core (Apple A7) by another 10 to 15 percent. Neither Qualcomm's Krait nor ARM's Cortex-A57 can compete with the resulting IPC. The exact design changes have not been revealed, but we would expect enlarged caches and registers as well as an optimized branch prediction. As an ARMv8 architecture, Cyclone 2 is 64-bit capable. 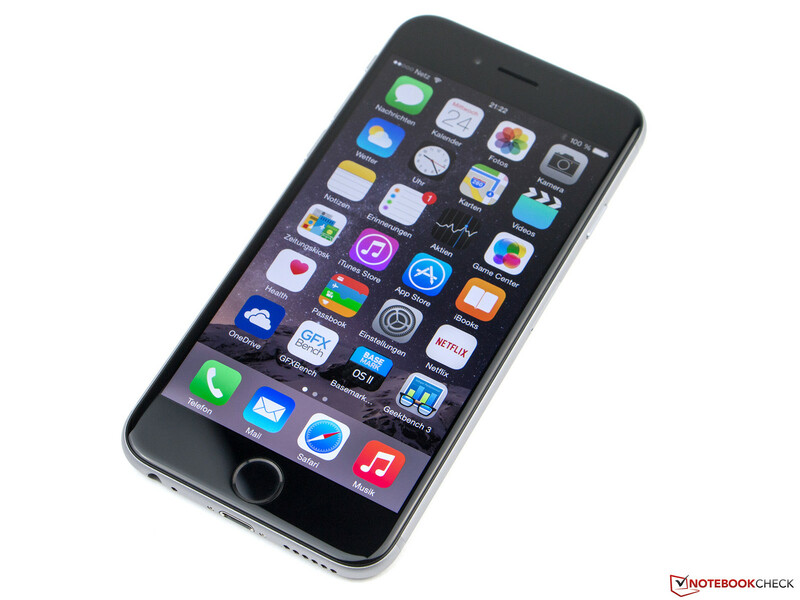 Compared to the previous Apple A7, the A8X offers about 20 - 70 percent more performance. Especially the multi-thread performance has been significantly improved thanks to the third CPU core, whereas the single-thread power is just slightly higher (~20 percent). According to Geekbench 3 scores, the A8X is the fastest mobile ARM-SoC as of late 2014. However, the chip clearly benefits from the 64-bit support in the iOS version of the benchmark. Without this advantage, Nvidia's Tegra K1 (Denver) dual-core is still somewhat faster in single-thread software (but slower in multi-thread tests). In contrast to previous Apple SoCs, the A8 und A8X are manufactured by TSMC instead of Samsung. Using a brand-new 20 nm process, the SoC consists of a whopping 3 billion transistors. Power consumption should be similar to competing high-end SoCs by Qualcomm or Samsung. The Apple A8 is a high-end ARM SoC (System on a Chip) launched in September 2014 alongside the iPhone 6 and iPhone 6 Plus. The two CPU cores are clocked at 1.4 GHz (compared to the 1.3 GHz Apple A7) and are based on Apple's 2nd generation 64-bit architecture, called "Cyclone 2". Furthermore, the A8 integrates a PowerVR Series 6 (Rogue) GX6450 GPU and a 2x 32-bit LPDDR3-1333 memory controller. With Cyclone 2, Apple have managed to improve the already high performance per clock of the original Cyclone core (Apple A7) by another 10 to 15 percent. Neither Qualcomm's Krait nor ARM's Cortex-A57 can compete with the resulting IPC. The exact design changes have not been revealed, but we would expect enlarged caches and registers as well as an optimized branch prediction. As an ARMv8 architecture, Cyclone 2 is 64-bit capable. Thanks to its impressive performance per clock, the Apple 1.4 GHz dual-core is a tough opponent for other high-end SoCs like the Nvidia Tegra K1 (4 cores @ 2.3 GHz) or Qualcomm Snapdragon 805 (4 cores @ 2.7 GHz). While the quad-core competitors win most multi-threaded benchmarks, the Apple A8 offers superior single-threaded performance, which is arguably more relevant for most everyday tasks like browsing. Overall, the A8 is one of the fastest smartphone SoCs as of late 2014. The SoC integrates a PowerVR Series 6 (Rogue) GX6450 GPU consisting of 4 clusters. Each cluster offers four FP16 and two FP32 ALUs, leading to a slightly higher shader performance than the former G6430. The core is predicted to be clocked relatively low at around 450 MHz (115 GFLOPS) to help reduce power consumption. According to our benchmarks, the GX6450 clearly outclasses the Adreno 330 in terms of 3D performance, but looses against Nvidia's more power hungry Tegra K1. Thus, the GX6450 is one of the fastest smartphone GPUs as of 2014 and can handle even the most demanding mobile games in high resolutions. In contrast to previous Apple SoCs, the A8 is manufactured by TSMC instead of Samsung. Using a brand-new 20 nm process, the SoC measures just 89 mm² and consists of about 2 billion transistors. Power consumption should be similar to or slightly below competing high-end SoCs by Qualcomm or Samsung.